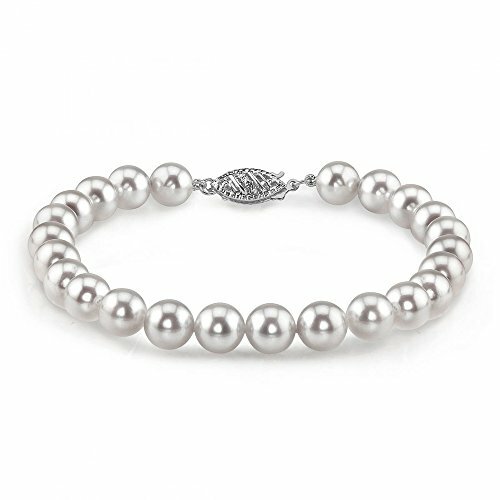 This beautiful Akoya pearl bracelet ranges between 6.0-6.5mm in size and consists of beautiful and lustrous pearls in AA+ quality. All pearls in this bracelet are round and are strung with silk thread and double-knotted between each pearl. This bracelet comes standard with a beautiful 14K gold clasp in either white or yellow gold. Known as the "icon" of cultured pearls, Akoya pearls have graced the necks, ears, fingers, and wrists of women for decades. All pearl jewelry items are packaged and shipped in a beautiful jewelry gift box, creating a truly elegant presentation. All Akoya Pearls are directly imported from the pearl farms of Japan. Our pearls represent the finest in pearl selection, hand picked for their luster, quality, color, and cleanliness. Each bracelet is affixed with the highest quality 14K gold clasp. The option is given to select either white or yellow gold based on your preferences. Only the most elegant jewelry boxes are used to package and ship our bracelets, ensuring the most beautiful presentation possible. Additionally, all products are accompanied with a genuine cultured pearl guarantee, verifying the quality and source of the pearls. Natural Stone Larimar Bracelet Crystal Magnet Clasp 7.5"